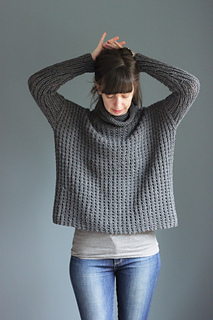 It’s knit in one piece from the bottom to the underarms, then the front and back are worked separately. 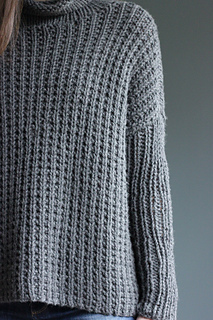 Shoulders are shaped using short rows and seamed together using the 3 Needle Bind-Off Technique. 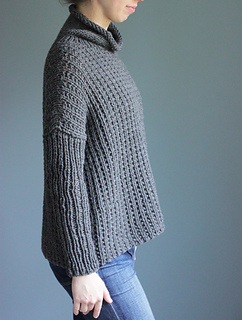 Sleeve stitches are picked up around the armholes and worked in the round to the cuff, and neck stitches are also picked up and worked in the round to create the cowl neck. 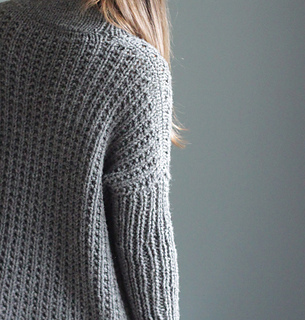 Instructions are very detailed so even if you have never done short rows or a 3 Needle Bind-Off before this would be a great introduction to them. Yarn: Approx. 672 (738, 782, 826, 892, 958) yds of bulky-weight yarn, shown in Vintage Chunky by Berroco (50% Acrylic, 40% Wool, 10% Nylon; 100g = 130 yds), colorway Cracked Pepper, 6 (6, 7, 7, 7, 8) skeins.